I gave up smoking cannabis nearly a decade ago when vaping was in its infancy and haven’t looked back since. Back then you only had a choice of one or two vaporizers and you had to import them from Europe or America. 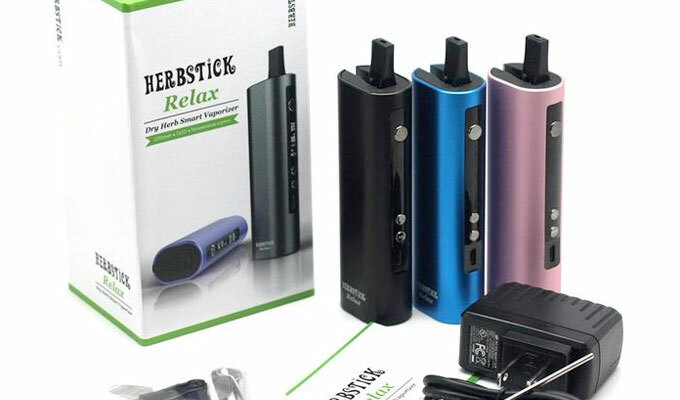 Now the UK is inundated with dozens of different models of dry herb vaporizers. So much, it can make choosing the right one quite difficult. To help make your search easier I thought I’d share some of the best weed vaporizers available to buy in the UK right now. Pax 3 Vaporizers, a real work of art! If there was an award for aesthetics, anything created by Pax would be head and shoulders above the rest! 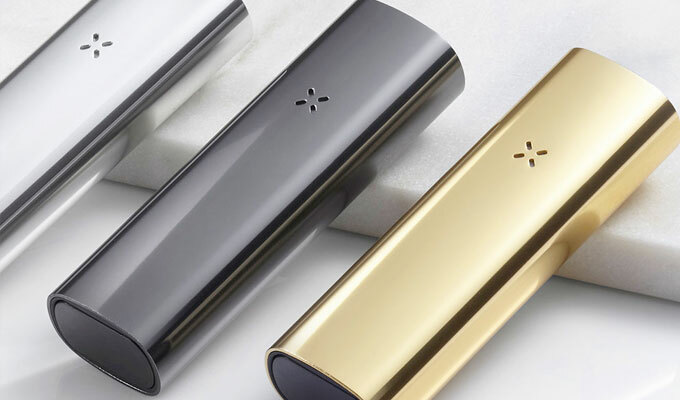 The Pax 3, however, is more than just a pretty face; it packs a lot of power and technology under its brushed aluminium hood too. Ease of Use: The Pax 3 is an absolute joy to use and is small enough to be operated with just one hand. With a single button at the bottom of the vape, you can power it up, change temperature and turn it off. For those of you who require a finer degree of control, there is an app you can download for your smartphone that not allows you to set the set the exact temperature. One the Pax 3 has reached your desired temperature it’ll vibrate to let you know it is ready ensuring none of that precious vapour goes to waste! Power: The engineers at Pax Vaporizers have managed to cram a massive 3500mah battery into the Pax’s small body. This is one of the biggest batteries available of any vaporizer on the market right now and provides double the raw power of the already impressive Pax 2. The Pax 3 will vape you herbs in under 20 seconds. Vaping experience: Further to the customisable temperature settings, the Pax 3 comes with the ability to choose the exact vaping experience you’re looking for. There are four options to choose from Stealth, Taste, Boost & Efficiency. Generally, The Pax 3 provides great taste and a good level of vapour. This is due to the air path being quite long so the vapour has time to cool down before it reaches your mouth. It may not have the changeable battery of the Ghost MV1 or match the heat the 5-second heat up time of the Firefly 2 but it doesn’t have the price tag either! The price starts at just £168 which is a fraction of the money you’ll be set back purchasing a flagship vaporizer from Ghost or Firefly. In my humblest of opinions, the Pax 3 offers the best combination of price and performance. 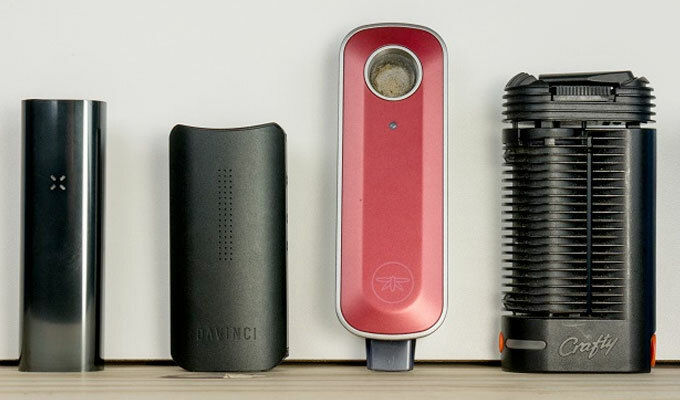 Runner Up Best Overall Dry Herb Vaporizer : Firefly 2 – A great vape with great technology but it’s the price tag of over £200 puts it out the price range of many vapers. The second entry from Storz & Bickel, the Volcano isn’t just a desktop vaporizer, it is the desktop vaporizer. If you’ve been Amsterdam, you’ll recognise the famous cone-shaped vaporizer inside pretty much every reputable coffee. 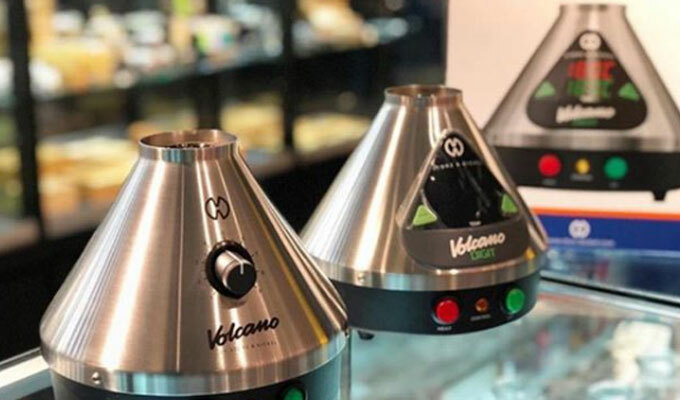 Simply put, the Volcano is most people’s first experience with a desktop vaporizer. This is bad news for their competition because after using the Volcano, you’ve already used the best. My Volcano is now maybe three years old and still works like it is brand new; it is clearly very well engineered. The vaporizer utilises a vacuum system that pumps air into the system. This air is then heated to a temperature that evaporates the cannabinoids in your cannabis which in turn, fill your balloon. One your balloon is full of air you can detach it from the device and enjoy the vapour. The only disadvantage to the volcano is maintenance – you have to buy replacement balloons. This will probably cost you another £30 / £40 per year. As its name suggests The Flowermate Hybrid X is possibly the most versatile vaporizer I’ve ever used. It’s the perfect choice for anyone who enjoys liquids, wax and oils as much as their herbs. Because it has a 510 thread atomizer tank it looks like a typical mod for E Liquids. However, if you remove the tank and turn it upside down, the body has a secret compartment for vaping weed too. You just pop open the body and you can slide out the glass mouthpiece and fill the oven with herbs. Furthermore, it comes equipped with special chambers for wax and oils too – it really is a true all-rounder. The dry herb experience with the Hybrid X is top notch. Its mouthpiece is made from borosilicate glass that whilst fragile, is hands down the best material for conduction vapour so it tastes great. The oven is a powerful ceramic oven that’ll produce vapour in under a minute and you can also pop in specially fitted chambers into the oven that you can fill with wax or thick oil. Flipping the vape around and screwing in the tank and you’ve turned your dry herb vaporizer into a mod that’ll produce humongous clouds from vapour instantly when you press the button. The only disadvantage I can think of for the Flowermate is that it does come with a lot of parts. It leaves me apprehensive to take it on travels with me in case I lose a chamber or mouthpiece. Runner-Up Hybrid Vaporizer: Flowermate Aura – 80% of the Hybrid Experience for 40% of the price to sum it up nicely! 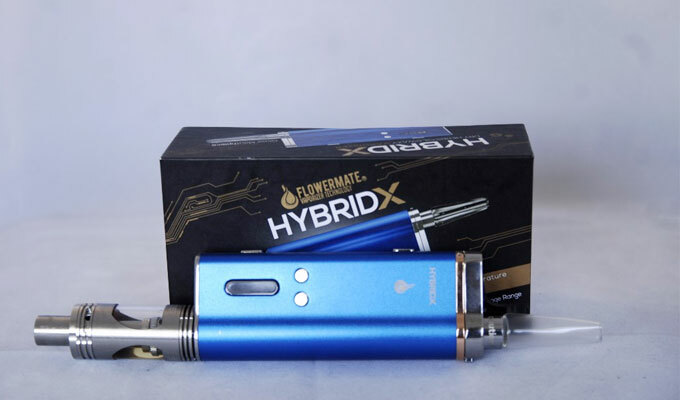 The Flowermate Aura has the same quality ceramic chamber and oven as the Hybrid but it does lack an atomizer. However it comes with nifty chambers you can insert into the oven which is compatible with wax, oils and liquids. If you can afford it, the Mighty was the daddy of portable vaporizers in 2018 and I can’t see that changing in 2019. The only reason I do not carry the Mighty everywhere I go is that it’s a tad too big; if the Volcano is a tablet and any other portable vaporizer is a smart-phone, the Mighty is probably be a ‘phablet’. One of the biggest advantages of the Mighty is that boasts a Hybrid heating system which makes the use of convection and conduction heating. This produces the thickest vapour out of any vaporizer I’ve ever used and reaches maximum temperatures really quick too. I’d argue that the Might provides clouds that can only be matched by a desktop vaporizer. Another plus point is its battery. On my last cycle with the Mighty I counted 9.5 10 minute vaping sessions before the battery went dead which great and as a bonus, it has pass-through charging which means you can use it plugged into the mains whilst its charging – so the fun doesn’t have to stop! Finally, the Mighty is super easy to use. Most vaporizers take a while to get the hang of, especially when you’re new to vaping but the Mighty just works. If you can afford it and you prefer power over portability then you can’t go wrong with the Mighty. Runner Up ‘All the monies’ Vaporizer: The Ghost MV1 – This was very close. Ghost are fairly new on the scene and have impressed with their first vape. This vape is pretty pricey too (£265) but its packed full of power and technology. Ghost as definitely a company to watch in the future. Wow – the Herbstick Relax is a refreshing surprise. Not only does it look great ( a bit like the Pax, only with a screen) but it packs a performance too! Its body packs a powerful 2200mah battery which is more than enough for a day’s vaping. 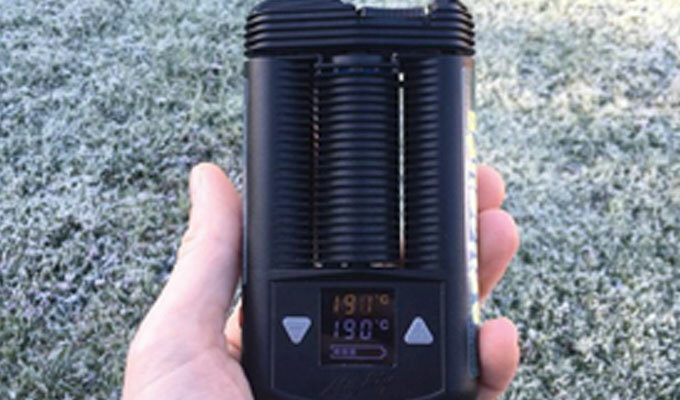 On top of this, it has a screen that allows you to control the temperature in 5c increments and a haptic feedback motor that lets you know when your herbs are ready to be vaped. All of this is packed into a tough but sleek aluminium shell that boasts a fold-away mouthpiece. All for 60 quid! The Relax is my favourite to carry to festivals as I know it is robust enough to take a good knock and it isn’t the end of the world if i lose it. £60 is a lot of money to me but I’d still rather lose this than a £300 Mighty! Runner Up: Black Mamba – The Black Mamba has a food-grade, glass mouthpiece, ceramic oven and produces vapour from cannabis in around 15 seconds. Did I say it costs less than £40?! Non-battery powered vaporizers were new to me in 2018 but I can see it catching on. I mean, I love vaping but sometimes I do miss the ritual of rolling up with some friends and using a lighter. The Dynavap brings some of the rituals of smoking back without filling your lungs with carcinogens! I’ve only used one other non-battery vaporizer before and it was a chore. It was difficult to know when my herbs were ready to be vaped so it sits on my shelf collecting dust. The Vap Cap, however, has a nifty innovation. It has a inbuilt thermometer that produces an audible click when your herbs are ready and then will click again when it needs to be reheated – it’s really clever and really simple. 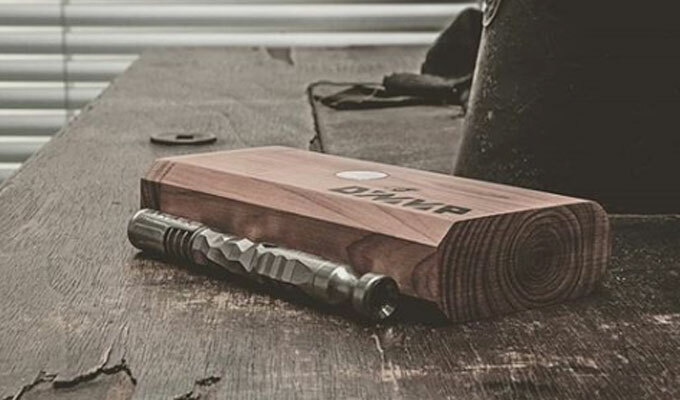 If you’re a bit of a pyromaniac and enjoy using a lighter and watching the flame, you’ll enjoy a Dynavap. However, I’d argue a non-battery vape is nice as an extra rather than as your main tool but that’s just my opinion of course! Whatever floats your boat. Read our Full Dynavap VapCap review. Runner-up Non-Battery Vaporizer: None – I have yet to come across another non-battery vape I’d happily recommend.